LAKE COMO, NJ -- Player of the Week Ky Meredith put on a defensive clinic Tuesday night, snagging six steals to go along with 27 points, 8 rebounds and 4 assists to lead the undefeated View to an easy 82-47 defeat of the Tigers. The Tigers got 22 from Andrey Bonelli and 21 from Jermaine Jackson, but the one two punch of Meredith and Mel Pitts (23 points) were too much to handle for the second place Tigers. The Tigers wrap up their regular season Sunday when they take on the Splash Bandicoot. The 7-0 View will meet the 0-8 Scorpions in what should be an interesting matchup. The short handed Scorpions were no match for the SuperSonics. The Sonics cruised to a 55-34 win. The 5-3 Sonics will look to lock up the 3 seed when they square off with the Flint Tropics next week. Those Flint Tropics celebrated their best win of the season, defeating their rivals, Splash Bandicoot 55-46. Splash struggled from outside the arc. 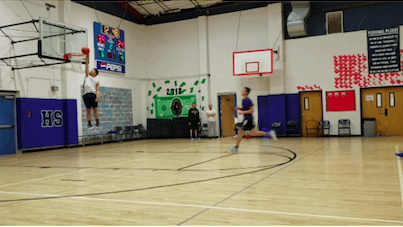 However the story of this game was Alex Pena who had the first slam dunk of the season and scored a game high 23 points. The Tropics keeps their playoff hopes alive. At 3-6 they need a win vs the Sonics next week and need help from the Tigers who take on Splash. As the playoff picture starts to take shape the question becomes, can anyone beat this View? With the playoffs on the horizon for the Winter Season, it's not too early to start thinking about the Spring League. We will once again be playing at the Academy Charter H.S. for another glorious basketball season. As a reminder, we accept full teams and individual players for the league. Games will be scheduled on Sunday nights, and possibly another weeknight, starting in May. Be sure to register before the April 30th deadline!